Like Alice in Wonderland, we believe that through reading, children widen their horizons. In our quest to become a Nation of Readers, we endeavour to employ an âinteractive model âof reading in which a reader uses in combination of prior knowledge and knowledge of sound-spelling features of words, sentences and word meaning to comprehend text. It behoves us today to ensure that students at the primary level are equipped with the goals of early reading instructions of automatic word recognition, comprehension of text, development of a love for literature and a desire to read. To hasten these goals, special efforts are made to immerse the students in books early, offer a moment to snuggle up to a good reading by an adult, and given the opportunity for âFree Voluntary Readingâ(FVR). 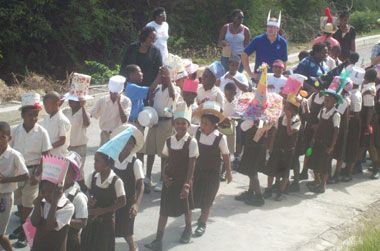 Thursday, February 10, 2011, was indeed a memorable occasion for students, teachers and parents of Canouan as they participated in the Hats off to Reading march from the school at Grand Bay to South Bridge and back to the school. The students, teachers and parents aroused the attention of the public with the singing of their reading chant, which encouraged everyone to read for fun, enjoyment and for gleaning. It was a thrilling moment for the students to showcase their creativity in hat designs. The celebration continued at the school with class presentations. The students demonstrated their reading skills as they rendered a variety of items including Readerâs theatre, Authorâs Chair, story report, interviews, chants and songs. Present with us at this memorable event was Carole Metsger, an annual visitor to the school from the United States of America. Metsger voluntarily assists slow readers and donates a number of books to the school. Headteacher, Jacqueline Charles in her address highlighted the importance of reading. She noted that the gift of reading can literally change and save lives. Reading can give individuals the power and skills to overcome almost any obstacles. Charles sent a timely warning to the listening audience that in todayâs world where much knowledge is transmitted by technology and twenty-four hour news channels the importance of the written word must not be discounted. The students were encouraged to read to give themselves the opportunity to succeed. The parents were urged to give their children the best gift- âa love for readingâ. Charles hopes that through the efforts of the home, the community and the school the dream of becoming a Nation of Readers will soon be a reality. The students enjoyed refreshments with the courtesy of Mr. Golatta Angello and Mrs. Sheppard.